Over the last few posts I’ve argued that Provo needs more housing for young professionals and families. But just how easy is it for people in those demographics to pay for housing? Returning to the census data I’ve referenced before, I found that the median value of an owner-occupied home in Provo is $212,400. 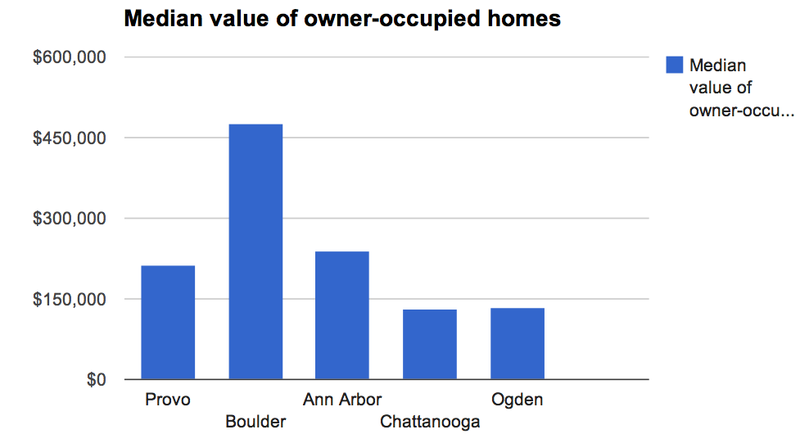 Among the four other cities I’ve used in past comparisons — Boulder, Ann Arbor, Chattanooga, and Ogden — that figure most closely resembles the median home value in Ann Arbor, which is $240,400. According to these figures, Provo is right in the middle of the pack when it comes to home values. And that’s a lot better than previous comparisons, where Provo came up as an outlier for its poverty and low wages. It’s better to be average than awful. The blue bars in the graph above represent median income in each city, while the red bars represent median income in those cities’ respective states. Taken together, these two graphs indicate that Provo has a lower income but potentially higher housing costs than other, comparable cities. That means it might actually be easier to buy a home in a place like Ann Arbor than in Provo. 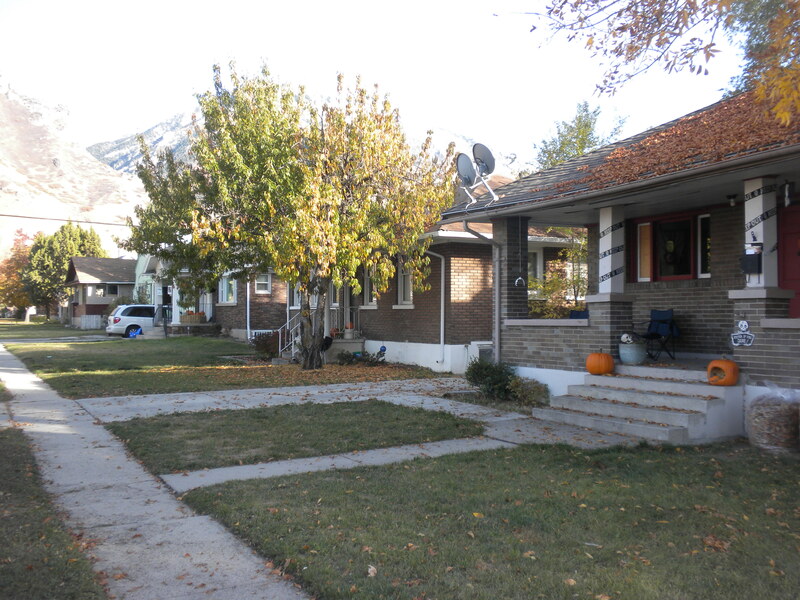 Houses in the Maeser neighborhood. The reasons for this housing situation are complex and certainly have to do with BYU and the large student population. (But again, keep in mind that all of the cities in the comparison are college towns.) BYU also has a particularly byzantine and economically detrimental housing policy as compared to other universities, which distorts Provo’s housing market in downtown. But I’ll save causal issues for later posts. For now, it’s particularly worth noting the high median home values in Boulder, which come in at a remarkable $475,200. Boulder is very frequently compared to Provo — by myself and others — but these figures show that such comparisons are really kind of like looking at apples and (solid gold, diamond encrusted) oranges. The point is that Boulder is significantly richer than Provo and the disparity between the two cities’ wealth helps explain the very different realities on their respective streets. In any case, it’s worth keeping in mind that housing values in Provo are yet another economic condition that make Provo… unique. Generally speaking, this situation is a function of supply and demand for housing and if nothing else the figures are actually reassuring: clearly there is demand for housing in Provo but not enough supply to depress values.